How to Find the Right Job Now! Our search firm is unique. Our founder and CEO Dr. Arlene Barro conducts her searches in an unusual way. She gives her client-employers one Right Fit candidate for each search and concludes the search. Can you present yourself as the one Right Fit candidate to an employer? Absolutely, if you learn her Right Fit Method. That's why she wrote WIN Without Competing! Career Success the Right Fit Way, nominated for a business book award, to teach you how to do what she does. Read what an employer said about Dr. Arlene's Right Fit Method. She placed 40 candidates with the founding Editor-in-Chief of WebMD, Tom Lombardo who shares his thoughts about the Method. More than 15 million people are unemployed. Every minute 20 people are losing their jobs. Those who blast their resumes from Burbank to Bombay could remain unemployed for many years because the competition mindset won't work in today's economic environment. Over and over, barro global search hears the same story. "I emailed 100, 300 and even 600 resumes hoping to get interviews." No response or perhaps one or two interviews is the result. Do you really believe that someone reads your resume? In fact, most resumes are not read. Now that you know this, it makes sense to search for a new solution to move your brand in the right direction. The solution is simple. You as the job seekers must use Dr. Arlene's Right Fit Method which is a unique set of strategies to identify the Right Fit Job, convince the employer to interview you and hire you as the one Right Fit candidate at the salary you want. Here are seven different ways you can learn Dr. Arlene's Right Fit Method. 1. Read WIN Without Competing! Career Success the Right Fit Way. 4. Listen to her radio show WIN Without Competing! on BlogTalkRadio in which she interviews guests who share their career stories and she discusses how they are using her Method. Be sure to listen to a special call-in show and take Dr. Arlene's Assumptions Quotient Quiz. 5. Speak with her on the telephone and learn from the Mistress of the Method exactly what to do to hear "You're Hired." To arrange an appointment with her call 310-443-4277. 6. Meet with her in-person. Interested in attending her Strategy and Support Seminars on a weekday at the corporate offices of barro global search on the westside of Los Angeles? Space limited. Email Dr. Arlene directly and explain why you should be selected to attend. Why is it urgent for you to learn Dr. Arlene's Right Fit Method? 7. 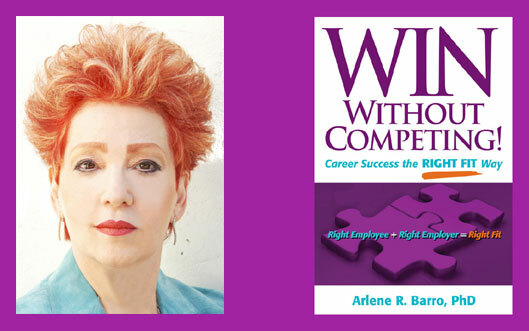 Invite Dr. Arlene to conduct her Strategy and Support Seminars where you live so that others in your community who are unemployed can learn the Method with you. Email her to arrange a time to speak. Remember we are based in Los Angeles. Start marching down the Right Fit Road to success. Here's how: Stop blasting your resume and select one or more Right Fit solutions. You will be amazed how using the Right Fit Method will unlock the employers' doors. It's all up to you!